Part of the purpose of our website is to educate the public about the health benefits of olive leaf. Olive leaf (botanical Olea europaea) is available in natural form and as an extract (OliveLeafMAX). Both are excellent choices to get olive leaf into your diet with the AntiOxidant, Cardiovascular, Immune system and Energy boosting properties. The naturally occurring compounds (free-radical scavenging antioxidants, oleuropein, hydroxytyrosol, polyphenols and flavonoids) in olive leaves are the key to olive leaf's healthy immune system boosting and other health benefits. OliveLeafNatural (Certified Organic) Products: Loose Tea, Tea Bags, Organic Capsules, and Bulk Powder, are all made with certified organic olive leaf. OliveLeafNatural products are made from natural wildcrafted olive leaf. These items contain a wide range of nutrients and healing properties in the natural leaf that are not present in straight olive leaf extract. In addition, the unique flavor reward of olive leaf tea is lost when taking pharmaceutically processed olive leaf. Use OliveLeafNatural for prevention, effective for immune and heart support, building energy reserves. Multiply the power of olive leaf for faster acting results. OliveLeafMAX Fresh Leaf Liquid Extract (4.5 Oz.) is an alcohol-free extract made from fresh olive leaf and can be drank straight, mixed with other liquids or used topically. 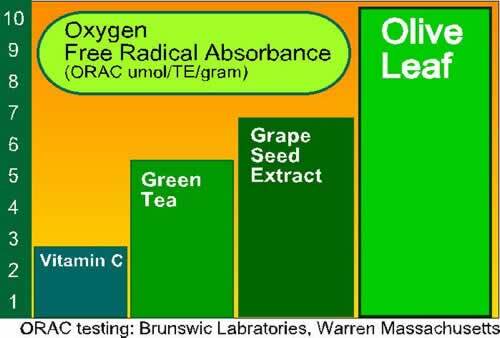 OliveLeafMAX tincture (alcohol based extract) is made with an alcohol extraction process and is highly concentrated and very potent (but bitter) taken straight. Tincture most commonly uses a dropper full added to tea of any kind, juice, or water. Available in 1 and 2 ounce dropper bottles. (Try it with Green tea!). OliveLeafMAX capsules are made with a standardized powder extract containing 25% oleuropein which is a proven immune system booster. A common approach is to introduce OliveLeafMAX to "shock" the immune system into action, Once balanced maintain consistency with OliveLeafNatural. Maintaining consistency is essential for maximum benefits. At Olivus we produce the finest olive leaf from Mission and Manzanillo olive trees orchard direct to you with the full range of beneficial compounds and properties.